This is our first artist interview on Maida Today. What fun! Annie and her patterns hold a sweet spot for me, as they were some of the patterns I (Dixie) first used when I started doll making. 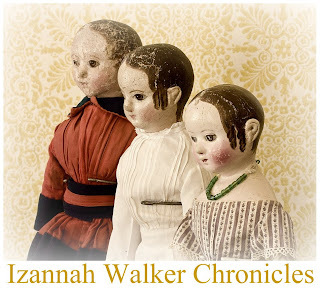 In fact, I used one of her patterns as a base for the first Izannah Walker inspired doll I made around 3 years ago. 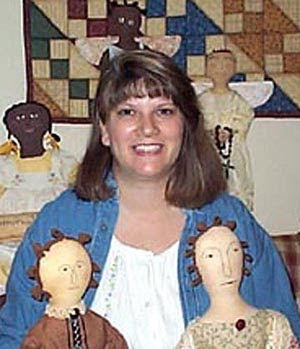 To learn more about Annie, visit Annie's blog and her Annie Beez Folk Art website, where you can purchase her patterns. Now on to the questions! making dolls and selling them? 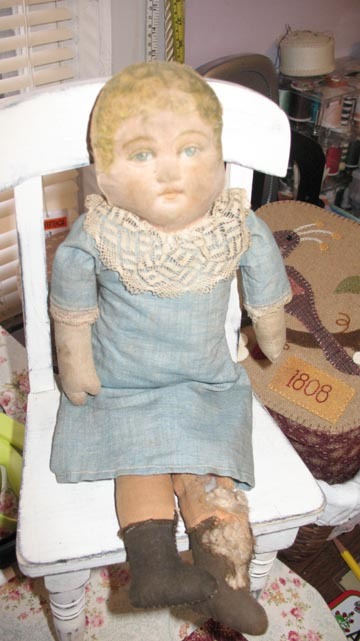 I made my first doll when I was about 19 years old, and I made several for my children when they were little. The first doll I made to sell was in 1999. It was a special order for a lady I met on an online primitive folk art forum. It was a big primitive doll, about 30", from a pattern by Nicol Sayre called Sophie Hopeful. I used a piece of vintage eyelet tablecloth for her petticoat! I remember I sold it for $45.00 and I thought that was so much money at the time! After that I began selling my work on ebay. Were you a doll person as a child? 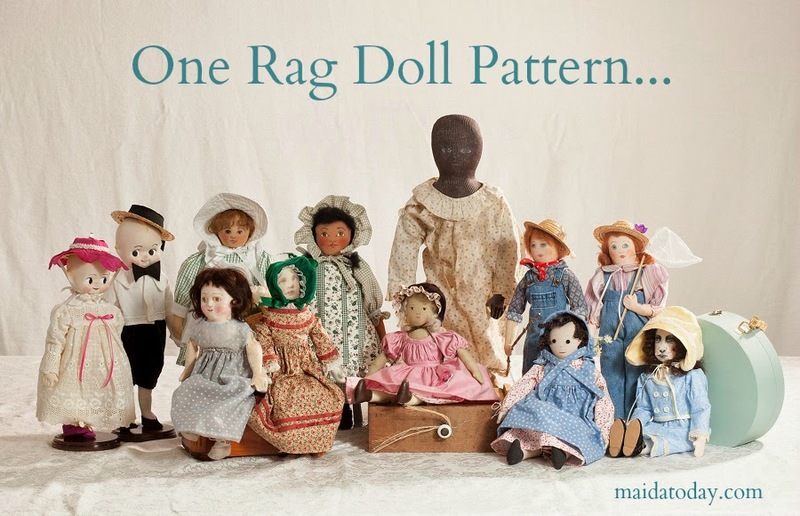 Do you remember making any dolls as a child? Yes I always loved dolls and I lived in a secret world playing with them! My dad built me a dollhouse out of orange crates and I had all kinds of homemade furniture that I had made. I remember a little desk made out of match stick boxes. I also used to design clothes for my dolls out of kleenex and rubber bands! What were your play interests as a child? Well I loved dolls, playing house, and every kind of craft. Things haven't changed that much! LOL! since you began doll making? How do you see it changing in the future? Well my skills have definitely gotten better, especially in terms of stuffing and proportion. 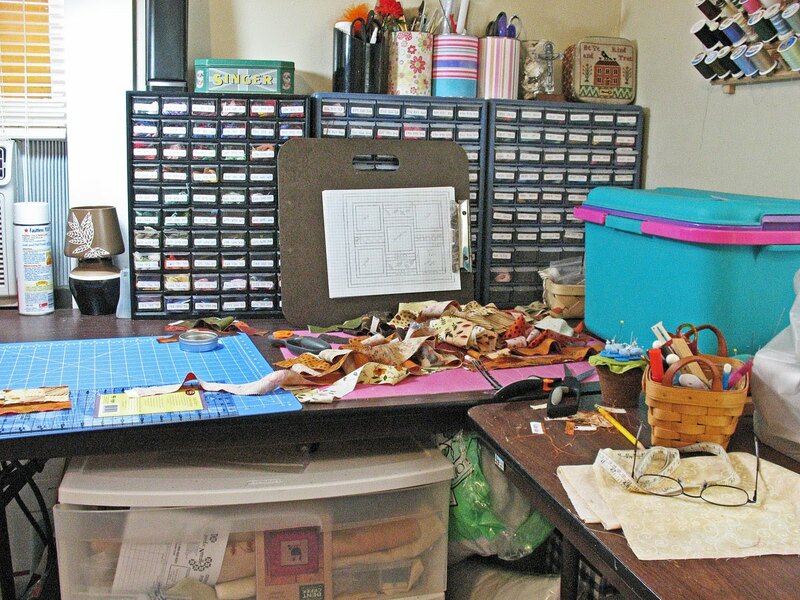 Since I began my business I have veered off from dollmaking a couple of times, as one of my problems as a business woman is staying focused on the business! I tend to be all artist, wanting to try everything new! Its great for your art, but can be confusing to customers. In the future I plan to stick to dollmaking and pattern publishing and resist the urge to do everything! I have been publishing patterns since 2002. I publish my patterns from a desire to inspire people, and I don't have a problem if anyone wants to adapt or expand on my idea. I think the main reason to buy a doll pattern is to learn a new technique, or try a new kind of shape,etc. I have learned a lot about pattern writing over the years and what type of format works for a person who is trying to learn something from a pattern. 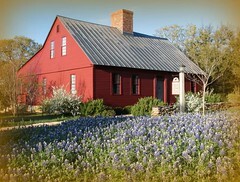 Well I live in a tiny little historical house that is jam packed full of kids and often their friends. So, although I once had an entire room, I have a rebound kid who is living there now and attending college. So now I have a corner of my bedroom which my husband graciously puts up with. Its a large room so it works out ok, and all of my excess storage is in the basement. I do have lots of light which is good, but I am 2 rooms away from the sink which is bad. However, my kids are getting older so I know I will have a full studio back again in the future! I am inspired by lots of other dollmakers, just about everyone really! I have had my favorites over the years. I love children's book illustrators, especially those who work in water colors and colored pencil. My favorites are Becky Kelly,Tasha Tudor, Mary Engelbrecht, Lispeth Zwerger, and I love the animated films of Hayao Miyazaki. I only own a very few. I have an antique Bruckner rag doll, a couple of vintage Raggedy Anns, and a vintage Godey Lady doll with a silk dress. 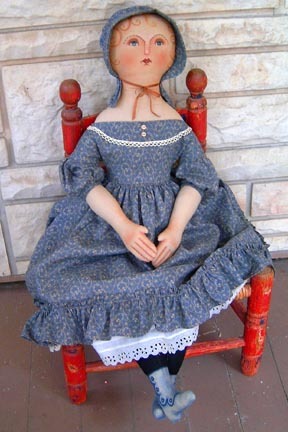 The Bruckner I bought at a folk art show from doll artist Kay Cloud-she gave me an incredible deal on this doll. At the time I was working in oils and I bought her to study the shading and that distinctive 19th century look! 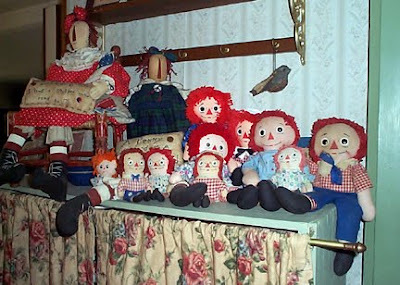 I went on a crazy search one time to replace the exact Raggedy Ann I had when I was little, and while searching I bought many RA's that spoke to my heart. I have a soft spot for RA, a lot of my early dolls were variations of this doll. The Godey Lady doll I bought on ebay-I just fell in love with this doll, especially her hair which was made from silk thread. She is handmade from a very famous pattern from around the 40's I think. She is not an antique-just a vintage doll. I love all of the Jane Austen books, most of Edith Wharton, but my favorite book is the Bible. I have been reading and studying scripture for a couple of years now and I am always so amazed at how wonderful Our God is, and how much He loves His people. There are lots of movies I love, like the Lord of the Rings trilogy, and lots of old corny movies like Its a Wonderful Life and The Philadelphia Story, and then of course the A&E Pride and Prejudice which I watch about 10 times a year! to the beginning doll maker/artist? Always put your very best work out there. Don't hold anything back, hoard any supply,or take any shortcuts. Always use the very best materials that are available to you. Use all available resources to improve your skills. 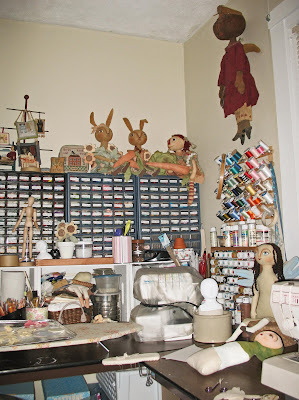 Join a dollmaking group, take online classes, do research on the internet and your local library to learn all that you can. Don't take it all too seriously! Try to create from the heart, the type of doll you like! Don't look around too much and think you have to do what other people are doing. The dolls that are successful are the ones that come from the heart, people just naturally respond to them because they are original and authentic. Have fun! What a fantastic interview! I really appreciated Annie's advice to new doll makers and all of the photos and everything else! I can't wait to read more interviews. Annie is a true inspiration!! It is obvious that she loves what she does and creates with her heart! Annie is an inspiration! :-) I agree! I loved reading about Annie. I've appreciated her dolls since I first one somewhere on the Internet. Gorgeous simplicity! I'm going to take her advice to heart and stop hoarding my stash. Primitive Cloth Bodies, Endless Variety!